(CNN) – The conservative super PAC American Crossroads said Tuesday it was buying $11 million in television time this week to air an ad sharply critical of President Barack Obama’s record on jobs. The group also said its affiliate organization Crossroads GPS would put $1 million toward radio ads and $4 million to air TV ads in competitive U.S. Senate races in North Dakota, Virginia and Montana. American Crossroads will air a Senate ad in Florida. Combined, the $16 million spent this week marks Crossroads’ largest buy this campaign cycle. “Obama’s weak leadership has yielded weak results and a weaker America. Staying on Obama’s course means a weaker America every day," Crossorads Chairman Steven Law said in a statement. In the presidential ad, which the group said would begin airing Tuesday, a man stands with a chart showing jobs losses since Obama took office. 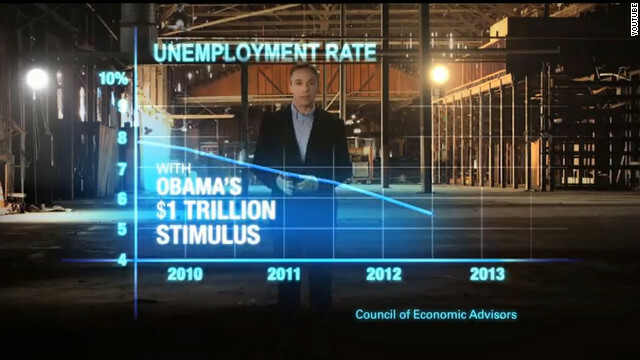 "This is what President Obama promised the jobless rate would be if we passed the stimulus: 5.6%. But this is what the jobless rate actually is: 8.1%. The difference? About 3.7 million jobs," the narrator says. "Obama's spending drove us 5 trillion deeper in debt, and now we have fewer jobs than when he started." The ad, called "Actually Happened," concludes: "What Obama promised, versus what he delivered." The group said the spot would air in eight battlegrounds: Colorado, Florida, Iowa, North Carolina, New Hampshire, Nevada, Ohio and Virginia. All are considered “toss ups” on CNN’s Electoral Map. Wisconsin is the only “toss up” state where the ad is not running. Danny Kanner, an Obama campaign spokesman, wrote in a statement the new ad "ignores reality - businesses have created nearly 5.1 million new jobs over the past 30 months, and we've cut our deficit by $1 trillion, which is part of the President's balanced plan to reduce it by more than $4 trillion." Politico first reported the latest Crossroads buy. There is something very wrong with spending this amount of money on stupid commercials . And the GOP complains about wasteful spending , you wouldn't think the economy is hurting when a conservative super PAC like American Crossroads spends that kinda cash. Reminds me of the GW Bush years. If Obama thinks he inherited a bad economy last time, wait till he has to deal with the economy he might inherit this time if re-elected. The big question will be, who would he blame this time around? It's time : BO MUST GO! Seems like Dems don't like it when you compare what the President said vs. what the President did. Very Critical , yet not much thought ! No Child left behind , maybe you just missed the bus .